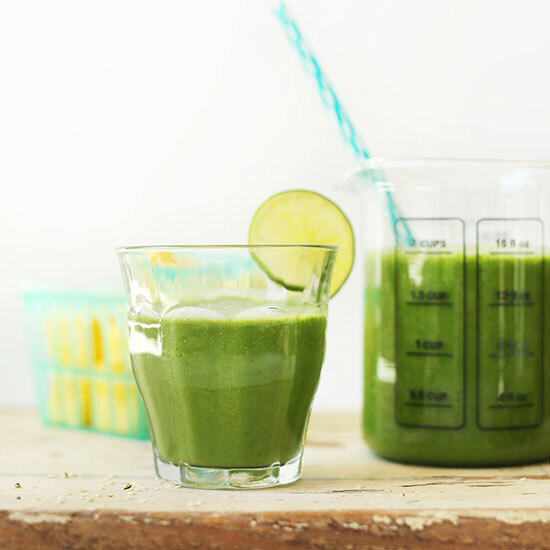 Allow me to introduce my favorite green smoothie. As in, ever. Yes, I may have had favorites before, and there may be new favorites in the future, but for the past 3+ years, this has been my go-to. If you love gingery, citrusy, coconut-infused beverages, this is the one for you. This recipe is a special one I’m sharing from our Everyday Cooking Cookbook! SO many of you have bought the book and we hope you’re loving it! Thanks for the support. Because I love this smoothie so much, it felt wrong keeping it from you so I thought it was about time I shared it on the blog. This recipe is simple, requiring 5 minutes, 1 blender, and 9 ingredients (that I now have on hand at all times – it’s serious). 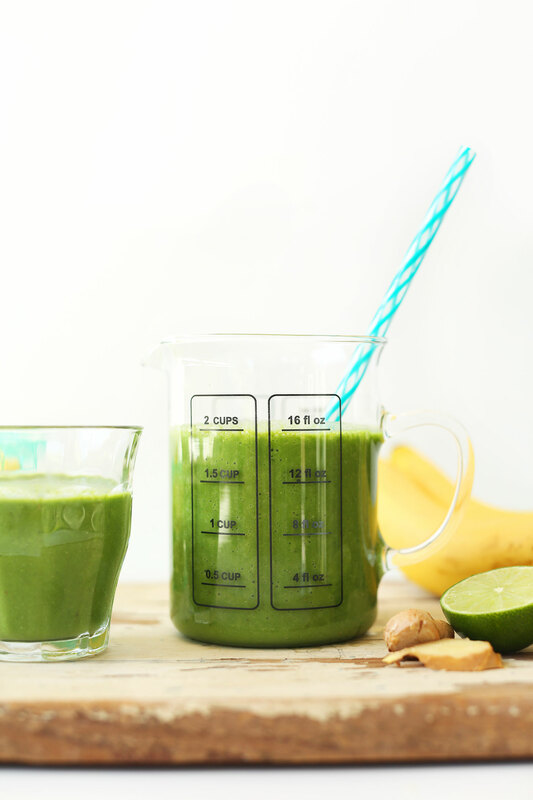 I used to prefer my green smoothies on the sweeter side, but this one has me craving all the ginger and lime juice. It’s the the perfect balance of tart and sweet, healthy thanks to tons of greens, fruit, and coconut milk, and is a flavor combination I’ll never tire of. This is our go-to smoothie in the morning if I’m not making a smoothie bowl. It’s perfect as is, but it can also be adapted to include vegan protein powder (although I still haven’t found one I like that doesn’t upset my stomach – oy). If you try this smoothie, let us know! Leave a comment, rate it, and don’t forget to tag a photo #minimalistbaker or #minimalistbakercookbook on Instagram. We’d love to see what you come up with. Cheers, friends! 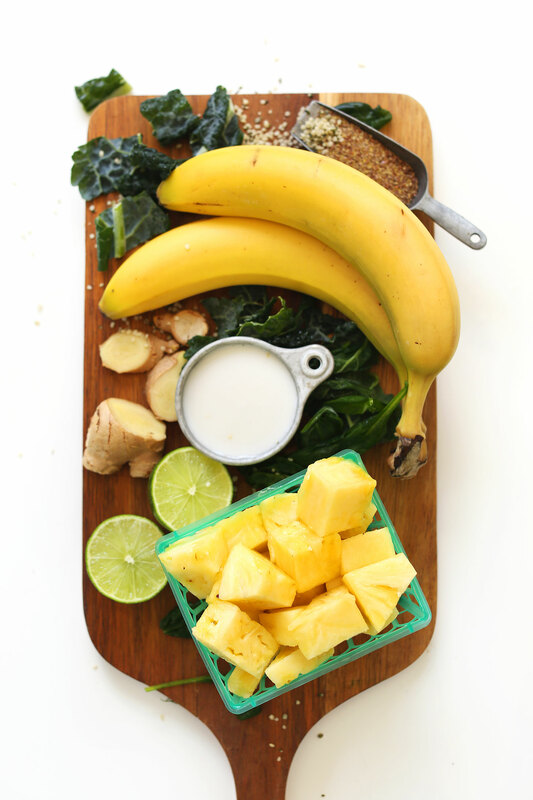 A creamy green smoothie infused with pineapple, banana, coconut milk, ginger, lime and greens! Healthy, refreshing, perfectly tart-sweet. Add all ingredients to blender in the order listed, and blend thoroughly on high speed until completely smooth. If it isn’t quite blending, add a bit more water or almond milk. Let blend for a good 1-2 minutes on high so everything gets very well blended together, especially the ginger. Taste and adjust seasonings as needed, adding a bit more frozen banana or sweetener of choice for added sweetness, lime juice for acidity, or coconut milk for creaminess. Serve immediately. Store leftovers in refrigerator for up to 24 hours, though best when fresh. *For spinach and kale, I like to buy mine pre-washed and bagged and keep it in the freezer. That way it stays fresh and is always available when I’m craving a smoothie. It also helps keep the smoothie colder and slightly more creamy. *Recipe from Minimalist Baker's Everyday Cooking Cookbook. Just tried this with a vegan protein from your review on proteins and loved it, definitely making this again, thank you! I love this smoothie and make it for breakfast all the time. I drink half and save the other half for the next day — saves perfectly. Yesterday, I didn’t feel like opening a can of coconut milk, so I used a whole cup of almond milk and threw in a small handful of dried unsweetened coconut flakes. Still delicious. And since my blender is powerful enough (Vitamix), and I’m lazy about my smoothies, I don’t peel the ginger anymore. So good!!! Very refreshing smooth and tasty! I like that its a thinner texture as well. I added a little less water but the thinner texture certainly makes it much easier to drink and more enjoyable. You always shine! thank you for being a part of my world! WOW! Not only was this great tasting, but it cut my congestion as soon as i drank it. Thanks!!! Yay! We’re glad to hear that, Robin! Can’t wait to try this! And I love the tip for freezing fresh spinach and kale! By the way, have you tried Arbonne’s vegan protein? It’s the only vegan one I’ve found that tastes good without being gritty. Delicious as usual.After discovering this one in the MB cookbook we’ve been having this quite often to add when we have something like toast for breakfast to add a few nutrients and flavour to our day. It is so nice! I have made it in a few different ways thanks to poor planning. Mango instead of pineapple has worked in the past (although pineapple is ideal!) as well as all Kale if we are out of spinach with no problems, we usually use some fresh ground flax or chia seeds as one of the recommended options and everyone drinks it up happily- except our baby for some reason. So I just freeze it in a ice block stick and she gobbles it up later in the day. Thanks for another great recipe! Would you be able to recommend a substitute for the pineapples? Other people left comments saying they used mango or frozen grapes! Hi Dana! I was trying to leave you a message on facebook, just wanted to give you a heads up… Someone is using one of your photos as their profile pic and stealing recipes. Home Cooking Mom was posting lots of stuff from TastyFood Recipes, and I recognized one of the photos and recipes from a guy in a cooking group I’m in. He reported one of them, and (surprise) both have changed their photos & other things. Home cooking mom is using your photo as her profile, and TastyFood Recipes is using a chef pic that’s all over the internet. Hope it gets straightened out easily for you. Hi Nettie! Thanks so much for reaching out. We will take a look into it and appreciate you taking the time to let us know. Cheers! Dr Schulze Super Protein plus…very delicious! I’m making this right now! Thank you for posting. Wondering though – why is there a list of adjectives, each on a single line, before every recipe? It’s a styling choice we’ve found works well for our site that gives readers a quick, easy-to-read way to know what to expect with each recipe. Hope you enjoy the smoothie! Why do you specifically use filtered water? Is it okay to just use tap water? Hi! It’s just what we prefer, but you can use tap water! I just made this for the first time this morning and, holy bejebus, this is my new favorite smoothie of all time! I’m keeping the second portion in the freezer… hoping it will keep. So fresh and yummy and GOOD. Thank you for posting this! I love your recipes and your site so, so much! I’m usually trying out a new recipe from you at least once or twice a week and they are consistently AMAZING! thinking about adding half an avocado for texture and extra meal replacement oomph. think that would combo ok?? I love your blog and recipes. Your photographs are amazing and even though i’m not vegan, I love to substitute some of my meals throughout the week with clean recipes. I was wondering where you purchased the measuring cup that is featured in the photos above as well as numerous other recipes? Thank you! I really do not like bananas. What can I replace them with? Hi! The beauty of smoothies is how interchangeable the ingredients are! If you don’t enjoy bananas, sub them out for your favorite fruit! Just made this smoothie for a post-workout breakfast! It was delicious! Loved the tip to freeze spinach and kale! Thanks! I tried this snoothie this morning. I still have the flavour in my mouth!! It’s so delicious! I didn’t add any maple syrup but I did add 3 dates for the sweetness. Silly me: I bought this book when it first came out, but only made this smoothie today. How have I lived so long without it?!?!?! :) This is probably the best smoothie I’ve ever had. And, at 47, I’ve had my share of smoothies, lol! So great! Thanks for sharing, Alyssa! Um this is super duper f-ing delish. I’m drinking it right now for the second morning in a row. I followed the recipe with the exception of using kale and collards instead of kale and spinach – just because that’s what I have in the freezer right now. And I left the skin on the ginger nub because I’m lazy (; My husband also found it delicious and he doesn’t always like my green smoothie concoctions. This is my first comment on your blog but I follow you closely and make and love many of your recipes. Keep up the good work! Some of my regulars include 5-ingredient granola bars and coconut curry. Mm mm! Made this today and added a scoop of vega protein powder and it was delicious! Instead of water I diluted the smoothie with ice since my fruit wasn’t frozen. Definitely will be trying out more of your smoothie recipes! This smoothie is liquid gold. My toddler and I loved it ! I used 1 tablespoon of coconut sugar to sweeten it. This smoothie is delicious! Even my husband likes it & he usually gives me a hard time with green smoothies. I’ve made it about 5 or 6 times now … i’ve used swiss chard instead of kale & spinach – only because it was what I had on had. This is definintely going in our morning rotation. thanks for a great recipe! Thank you!!!!! I love it. I have already prepared this delicious recipe 5 times. One cup to drink, another to keep in the fridge for the following day. Adding oats makes it a perfect breakfast, that keeps you with a full stomach sensation for the whole morning. Next time, I will chop all the ingredients and keep them in freezer bags, so I will only have to add the content and the liquids in the blender in the morning. Thanks again, and congrats on your beautiful web, perfect pictures and graphic design. I just made this smoothie and absolutely love it! Love the tangy flavor from the ginger and lime. I didn’t have frozen pineapple, so I subbed frozen green grapes and those worked out great! So good! I left out the banana because I don’t care for it, went a little light on the ginger and heavy on the lime. Perfect! I also added MCT oil and protein powder. I usually have to make myself drink smoothies, but I loved this one. My two year old son liked it also! Thanks for the great recipe! This is almost the exact recipe I’ve been using for my morning smoothie but I love your addition of the ginger! Looking forward to shaking my smoothie up a bit. My favorite veggie-based protein powder is Spirutein – it’s pea, rice, and soy protein. Have you tried that one? 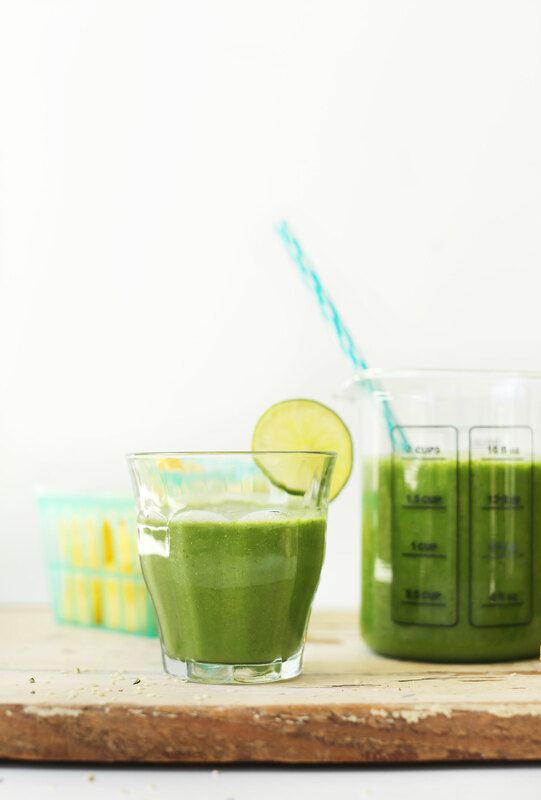 I have been looking for the perfect green smoothie recipe, and I think I just found it! I had this for breakfast this morning and absolutely loved it. Made this for me and the hubby this morning. So good! 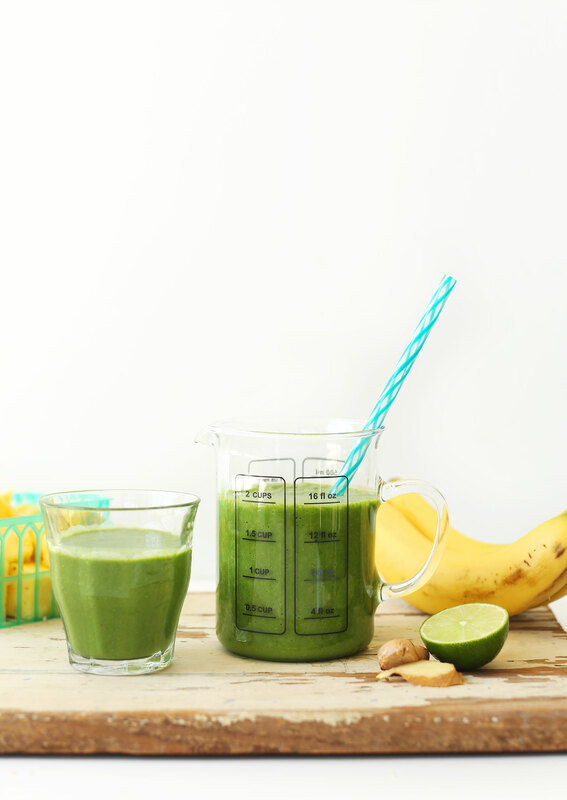 There are lots of great fertility friendly ingredients here so I dubbed it our “baby making” smoothie! This recipie really got all the flavors perfect! on the week to your account. since they bring the temperature down rather quickly. Made it, love it! Perfect for this NYC heat wave. Lovely! I haven’t heard of that – thanks for sharing. I think I was dealing with stress when I was looking for protein powders and that’s why none of them sat well with me. But I’ll definitely give that one a try! Thanks, Melissa. I thought I was the only one who added ginger to my colada smoothies! Ha ha This particular combination sounds delicious! For folks who don’t care for ginger (hard to imagine – but I know they are out there – my daughter is one of them!) I bet 1/2 tsp. ground cinnamon would be a tasty replacement. I love the combination of ginger and pineapple. Yum! Please expound on the freezing of Kale and spinach ! I just buy organic pre-washed spinach and kale and throw it directly in the freezer! I love your cookbook recipes! There are so many that I have to start making! :) Will let you know when I do and how they turn out! Do you really freeze the spinach and kale without blanching?? If so, what a time saver! Yes! Throw the whole bag of prewashed kale + spinach in the freezer! I too have a problem with most protein powders, being allergic to both eggs and whey, and I was thrilled to find Manitoba harvest – their powder has more staying power than just hemp hearts. I get mine at an awesome price from thrive market. btw, your site is, my go to food blog. I’ve made a bunch of cream pies – my cheesecake loving husband had asked for repeats several times and can’t believe they’re vegan. thanks for such awesome recipes! Lovely recommendation – thank you! Dana, this smoothie sounds delicious and healthful. One question for you about your tip to freeze spinach/kale: how do you freeze them? Do you put the entire pre-washed bag in the freezer? Or do you separate them beforehand? I buy pre-washed and then throw them right in the freezer. Or, I’ll wash the kale, dry it, and then freeze it! This looks super delicious. I like adding a small piece of ginger to my smoothies because ginger is a natural antibiotic and it’s delicious. This smoothie sounds delicious! Lately I’ve been craving more tangy smoothies, rather than super sweet. adding ginger and lemon or lime juice is the perfect way to do this- and gorgeous photos, as always Dana!! Me too, I’m liking sour more and more since I stopped eating white sugars. It’s amazing how “sweet” everything tastes, like gross sweet when you haven’t eaten sugar in awhile. Wedding cake, yuck, whereas I used to eat like 3 pieces of cake all all those frosting no problem. And I was 15 pounds heavier. I like smoothies like this in the more, the ginger seems to be a great energizer!